Karl Marlantes | Read it! Read it! BookTalk at BSC, the Library’s annual book discussion series, continues with a discussion of Matterhorn by Karl Marlantes on Sunday, February 7. 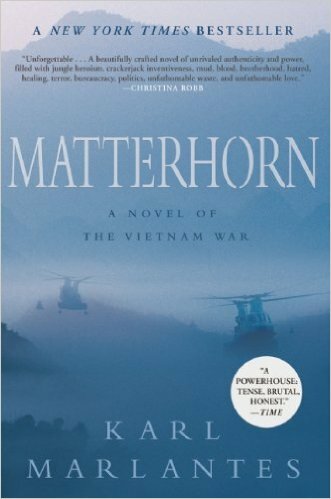 Dr. Perry Hornbacher, Professor of History, will lead the discussion in LEA Hall, Room 204, from 1 to 3 p.m.
Matterhorn is an epic war novel about what it is like to be a young man at war. Set during the winter monsoon of 1968-69, it recounts the experiences of a Marine lieutenant and his company, who are dropped as boys into the mountain jungle and forced to fight their way to manhood. It is a story of courage, camaraderie, and sacrifice. Whether you’ve read the book or not, finished it or not, join us. BookTalk discussions are interesting, fun, free, and open to all. Bring a friend … or two! You will be home in plenty of time for the Super Bowl. For more information, check out this guide. BookTalk is funded by the BSC Library and a grant from the BSC Foundation.